I saw the inspiration for this in an old cookbook and waited till I could get young beets for the recipe. I went out to my favorite farm this morning and Anette found me all sorts of good veggies in her gardens. My eyes spied beet greens growing and I asked if they were ready. Small tender beets with crisp leaves on top. I don’t know exactly how many pounds I had, I came out with two massive bunches. This is a recipe for farmer market beets, not grocery store ones. The leaves are often wilted and very, very dirty or yellow. On a random guess I’d hedge you need around 3 pounds total. Beets might not be well-loved by everyone, I have always wondered if that is because the haters haven’t had good fresh ones? Canned beets could turn off pretty much anyone. The pasta is a pretty pink hue, speckled with dark green. Leave the cheese out and the recipe is vegan-friendly. Have meat lovers? Sprinkle on some crispy & crumbled bacon and toss. Cut the tops off the beets, set aside. Scrub the beets, place in large saucepan, cover with cold water. Bring to a boil, lower heat to maintain a boil, let cook until fork tender. Drain, cover with cold water to cool down. Rub the skins off, trim the top and bottoms. Slice into bite size pieces, set aside in a bowl. Trim the stalks off the leaves, discarding the stalks. Add the leaves to the sink, fill full of cold water. Let soak for 10 minutes or so, scoop out and drain in a colander. Dry on paper towels, blotting up most of the moisture. Roll up bunches of the leaves, chop into small pieces, set in a large bowl. Bring a large pot of lightly salted water to boil. Add pasta, cook for time on package. Reserve ¾ cup cooking water, drain pasta. Meanwhile, heat a large skillet over medium heat. Add oil and onion, sauté until tender, about 5 minutes. Add in the garlic and red pepper, turn up to medium-high. Ad the beet leaves and toss with tongs, cooking for about 3 minutes. Add in the beets and turn down to medium. Keep stirring/tossing until the leaves are deep green and fully wilted. Add the pasta with reserved water, keep tossing until mixed. Sprinkle on cheese, toss in and add more if desired on top. Previous Post Book Review – Hello Cupcake! Not only does it look delicious…it looks beautiful too! I love how the pasta turns such a lovely pink color! I haven’t tried beet leaves – what would you say they are similar to? I’d say between swiss chard and spinach – very mild tasting, not bitter like kale can be. I wish I had tried them years ago! 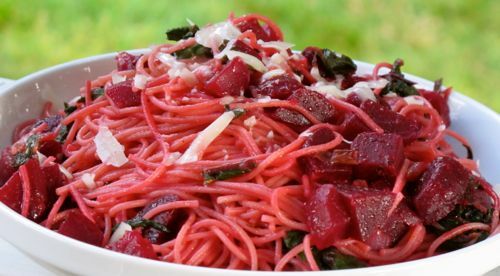 This appetizing beet & pasta dish is one I would so devour!! 🙂 Yummy! I have made your tasty pasta & loved it so much! So gooodddd!